In mid-January a very bright (brighter than a full moon), green fireball lit up the skies of southern Michigan and those in northern Illinois/southern Wisconsin and northwestern Pennsylvania also saw it. It was made by a small asteroid about six feet wide that slammed into the upper atmosphere at 28,000 mph and exploded with the power of 100 tons of TNT. It produced a magnitude 2.0 earthquake from the air pressure wave when the small asteroid broke up at 15 miles altitude. The small asteroid was just one-tenth the size of the Chelyabinsk, Russia asteroid that exploded in 2013. Near the end of January people were finding small chunks of the asteroid as small black meteorites on top of the white snow. They were fortunate that this happened in the winter when there’s usually a lot of snow on their ground, making the black rocks easy to find. The small chunks, about an inch across, all have a black coating, called fusion crust, about 1-2 mm thick from the great friction heating as the meteor moves through our air. The interior of the meteorites are gray as would be expected for a common stony meteorite. The original small asteroid probably had an eccentric orbit that looped out nearly to Jupiter. Well, no more! Earth is its final resting place. It would have been better if this event had happened in early April because it would have been a great advertisement for the April 19 showing of “Incoming!” at the William M Thomas Planetarium. Maybe another gravitational wave event as two black holes merge will happen this month to kick off the spring season of shows with “Black Holes” on February 15. I’ll look into seeing what I can do to make that happen. A new show for the Planetarium this season is “From Dream to Discovery: Inside NASA” that will show on March 15. I wanted a show that highlighted the engineering side of space exploration and this one describes it well. It takes a lot of world-class engineers to create the spacecraft that will make out-of-this-world discoveries! Details about all the shows are available on the William M Thomas Planetarium’s website. To create a science satellite takes at least ten years work to go from design, to construction, to testing, to finally launch. There aren’t any new Earth science satellites in the pipeline, so when the current fleet of craft in the A-Train wears out, we could go dark without any global observations of various aspects of Earth’s changing climate system that can only be done from space. That was why I read with interest an article about NASA purchasing data from commercial satellite companies. The article told how data from smallsats (each about the size of a microwave oven) could augment data from the larger, very expensive Earth-observing satellites of NASA and NOAA. One problem with the smallsat companies is that it is difficult to quality-assure data as the companies come and go with alarming regularity and hardware/software changes very quickly. One unforeseen obstacle to NASA purchasing data is that NASA has a free and open data policy. Since commercial satellite companies make their money on selling data, the giving away of the data they purchased could be bad for business. I suspect that as the commercialization of space continues apace, the anti-capitalist policy of NASA will be changed sometime down the line. The evening sky is pretty bare of solar system objects with just the moon making an appearance well after sunset. 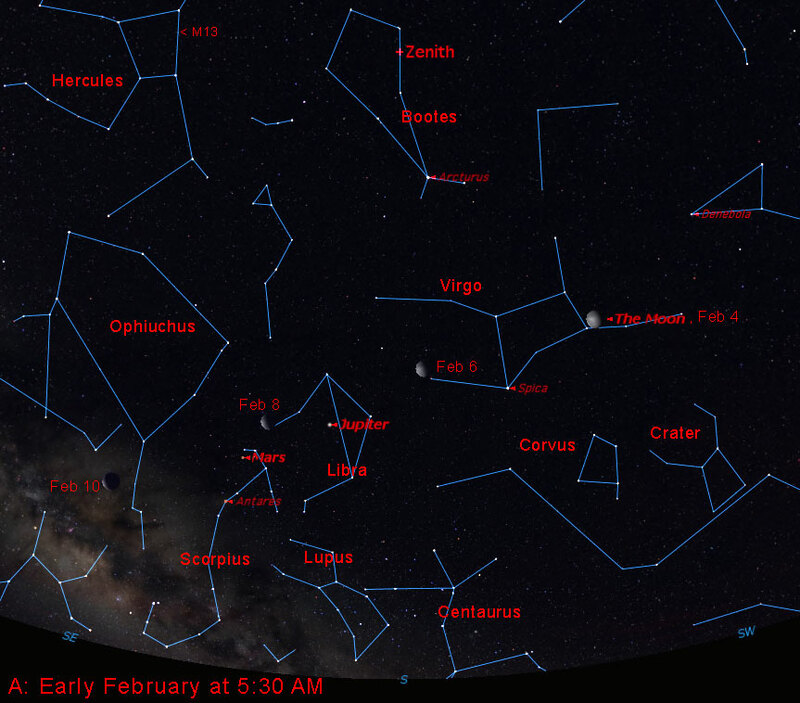 By mid-February, you may begin to see Venus low in the west just after sunset. Venus will continue climbing higher in the sky, so in early spring we’ll have a brilliant “evening star”. We do have the gorgeous display of winter constellations gathered around Orion (see the second star chart below). Orion is due south by 8:30. His belt stars point down left toward the brightest star in the night sky, Sirius, at the nose of Canis Major. As far as planets go, the more interesting sky-watching isn’t until a couple of hours before sunrise (see the first star chart below). By then you’ll be able to see the line-up of a waning gibbous moon at the right side of Virgo, Spica at the left side of Virgo, Jupiter in the center of Libra, Mars at the head of Scorpius, and Antares at the heart of Scorpius. The moon may be a bit too bright, so wait a few nights when a waning crescent moon will be nestled between Jupiter and Mars. 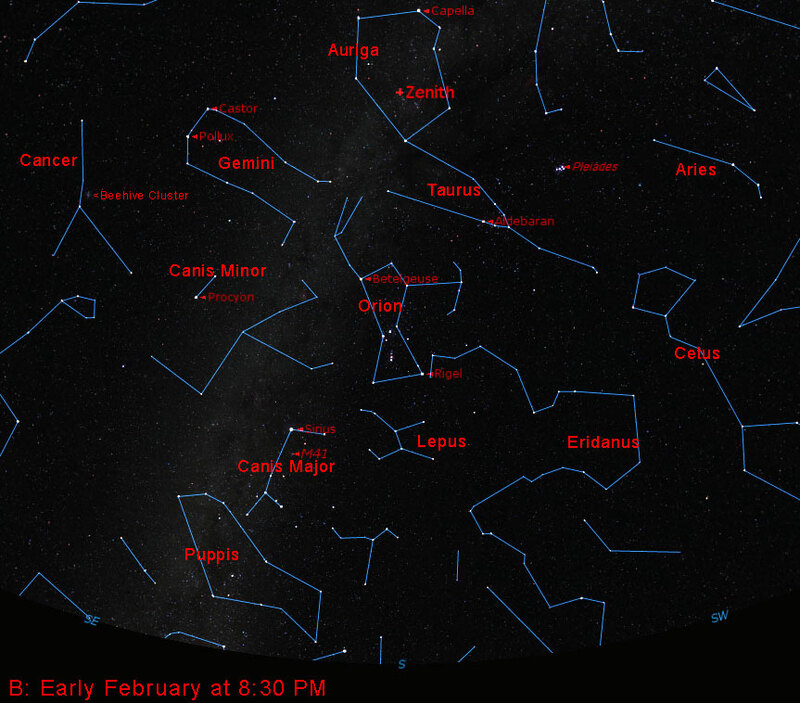 Through mid-February Mars will get closer to its rival, Antares. Compare their color and brightness. Mars is getting slowly brighter as we catch up to it in our faster orbit. I hope to see you at one of the February shows: “Black Holes” on Feb 15 and “Supervolcanoes” on Feb 22.